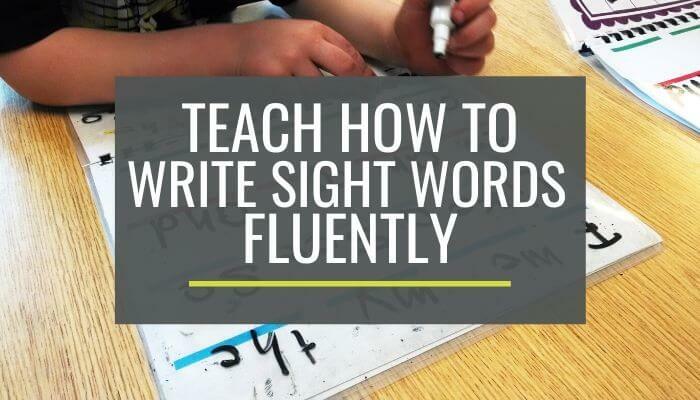 My students need to know sight words. They are a key step in the reading process. They aren’t the end-all-be-all, but they do play an important role in learning how to read in kindergarten. Here is one mini-lesson I do – I call it a warm-up activity – with my guided reading groups. There are so many things that go into learning how to read: There is phonemic awareness, learning letter sounds, manipulating letter sounds and reading words by sight, for example. Well, during my guided reading group lessons, I like to focus on all of these skills since they all matter! One easy way is to do a warm-up (or mini-lesson) before we get into the main content of our lesson. 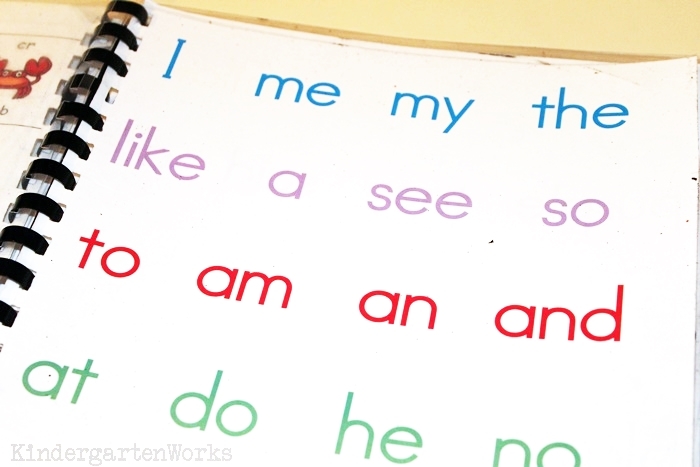 The focus of this warm-up is to assess and encourage my kinders to learn how to write sight words – not just read them. Some students will naturally be better at this based on their strengths but it is good to practice since we expect them to spell these words correctly in their writing amidst lots of phonetically spelled words at this age. We use a sight word chant as our basis. Well, it is pretty much our key 24 sight words set to the tune of a march. We use it, practice it and learn it just like we do the alphabet chart every day. You can get my sight word chart and chant as an instant download and use it tomorrow if you don’t already have one in place. Since my students can practically recite it by heart, just like they can when singing the alphabet – we now focus on building up our writing fluency for these words. 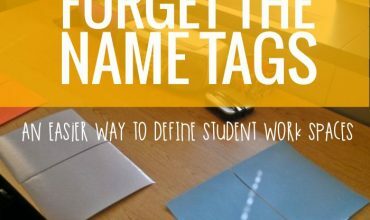 Since this is a small group activity it’s quick and easy! 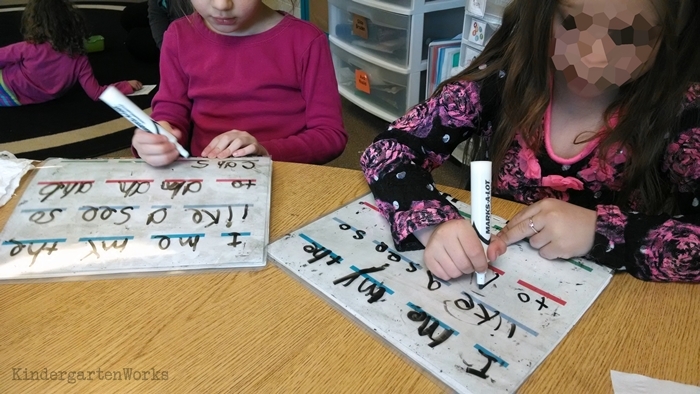 I give each student a dry erase mat with pre-made lines (and a plastic page protector cover so they can erase easily). The dry erase mat features colored lines in six rows. Each horizontal row has the same number of lines that the chant has words. The lines match the color of the words in our chant too. 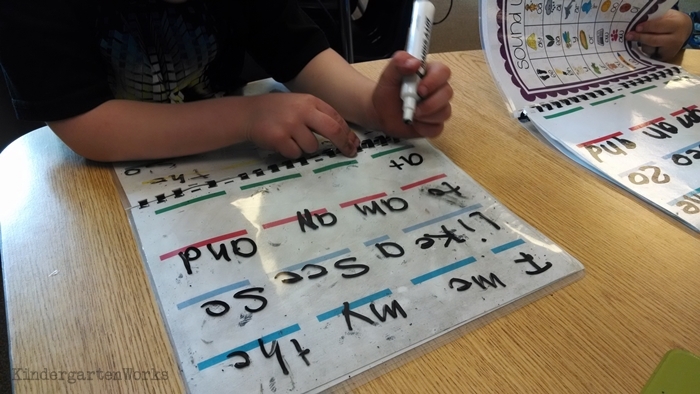 This blank sight word workmat is for them to write the chant in order and see how far they can get in two minutes. I want them to write the words in order — so that way they can spend time focusing on how to spell the words — rather than spend time thinking up words (if we just did a “write the words you know how to spell” kind of deal). We celebrate how many words they each got correct (and how far they got through the chant). When we repeat the warm-up we celebrate how many more they get (and they do get more). Since I jot down what they did last time in my guided reading binder, I can remind them of last time compared to now. This type of activity was very motivating to my students who were getting this whole ‘reading thing’. I would normally start this activity with a group when they could read roughly 18+ words or more. 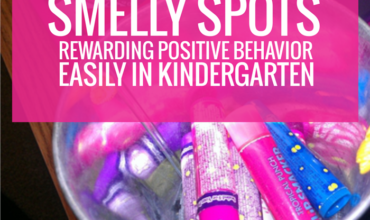 It was a natural next step – from reading the words to learning to write sight words fluidly or fluently. Surprisingly, it was very telling to see which of my students were more or less grapheme inclined. 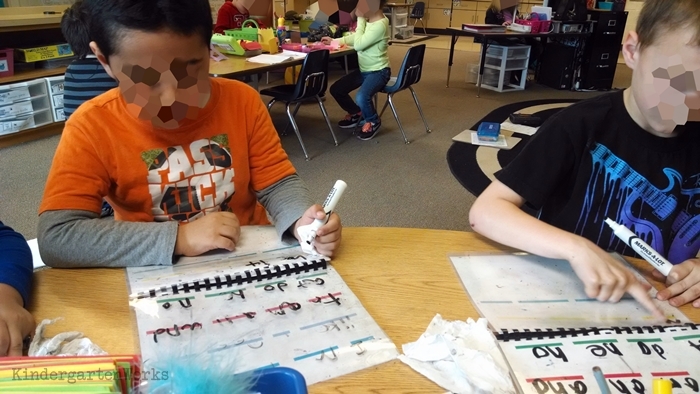 If they seemed to struggle with this activity, I knew there was more I could do to help them focus on the way words look and build up their grapheme skills. If they blew it out of the water or were higher readers to begin with, we could tweak this same activity with the next set of 24 words so that way everyone was always being challenged. This warm-up activity was used every couple of weeks, so I stored it in a place with easy access. 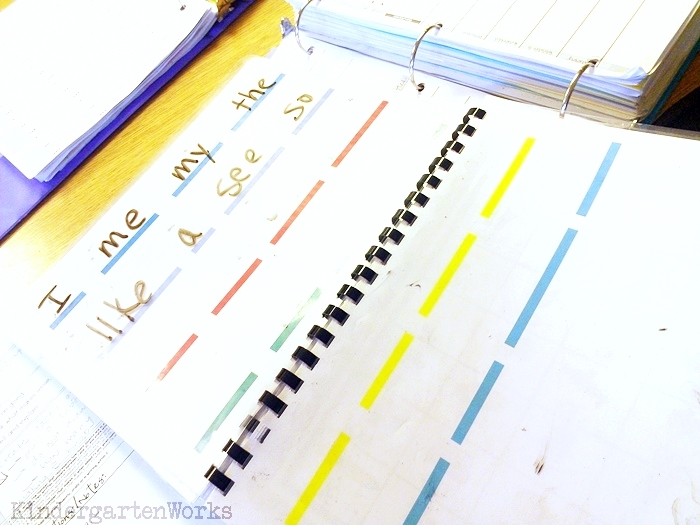 Our guided reading workmats were the perfect place to stash the colored lines template. Easy to hand out — easy to clean up! I hope that you can use this type of warm-up mini-lesson with your kinders who are learning how to read in kindergarten and working to write sight words. 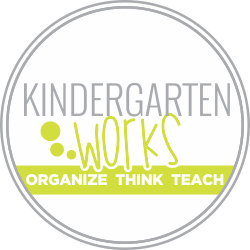 Ready to work on sight words with your kindergartners? I’ve got your back with my Sing to Learn Sight Word Songs – they are easy peasy little songs you already know with lyrics changed to teach your kiddos how to spell and read each word. 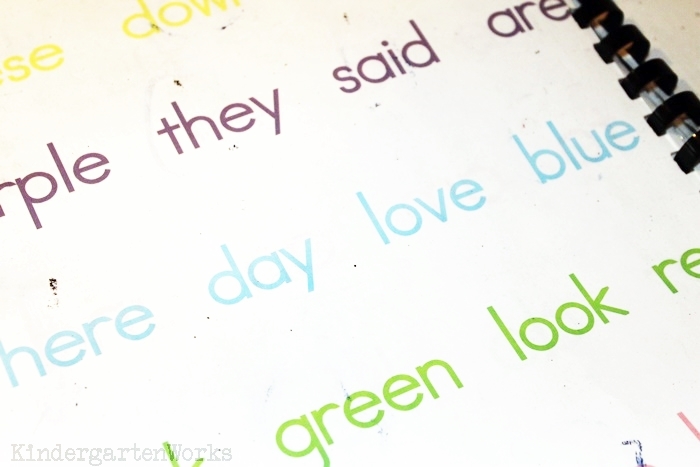 You’ll get 31 sight word songs, the two sight word charts I mentioned here plus more. Want to know what else to keep nearby for warm-up lessons? Here is what else you should have near your guided reading table for your growing readers.